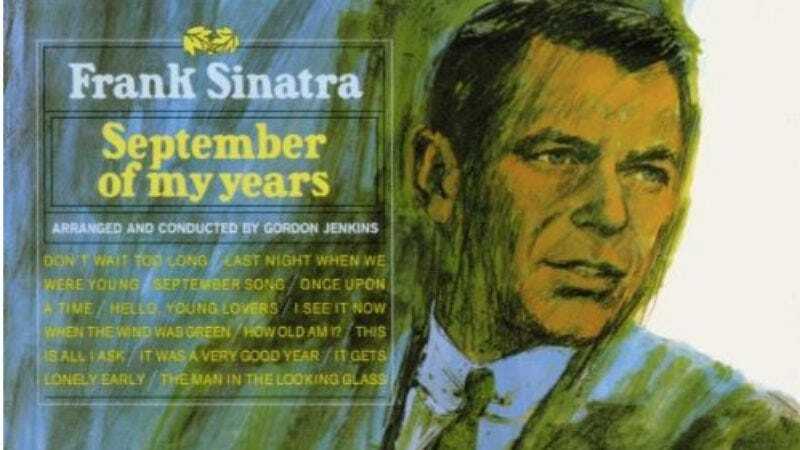 In September 1965, just three months before turning 50, Frank Sinatra released September Of My Years, a concept album that focuses on a man turning 50 and reflecting on his life with a certain amount of wistful longing and nostalgia. The album, which was released 50 years ago this month, won the 1965 Grammy Award for Album Of The Year and Sinatra won the 1965 Grammy for Best Male Pop Vocal Performance for “It Was A Very Good Year,” a song originally written and composed by Ervin Drake in 1961 for The Kingston Trio. The Turtles also recorded “It Was A Very Good Year,” as part of their album It Ain’t Me Babe, released in January 1965, but it was Sinatra who made the song a hit. As Ervin Drake explains in the video below, Sinatra heard The Kingston Trio singing “It Was A Very Good Year” on the radio while driving in his car and stopped at the nearest gas station to use a pay phone to call Gordon Jenkins, who was arranging September Of My Years. Sinatra told Jenkins he wanted to record the song as part of that album.